Tonight I was lucky enough to attend the Mardi Gras VIP press conference in preparation for the finale event of our season party. I met some great people tonight. Adam Lambert (the American Idol runner-up) who is just adorable and so into just partying with the Sydney boys. Kelly Rowland, who I must say is absolutely gorgeous. She kissed me hello, and i’m not washing my face tonight! And all of them were just lovely. Lovely.. and so excited to be in the room with us all and at a Mardi Gras function. 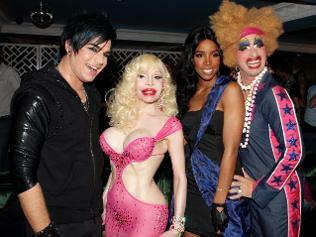 Joyce Maynge was there too, as well as well, my secret ( “I would so do a drag queen”) crush – Courtney Act. Gorgeous gorgeous gorgeous as always. Of course the rumour mills are running way way way overtime on who our special guest will be on the night, but I can tell you this… There is going to be 4 international guests at party this year. Now, I’ve been around this party since 2003 in some way or another, and this old girl is very very excited about this one. So…. as readers of this blog, I wont have any of you say to me on Sunday or Monday, “Why didn’t you tell me… I would have got my scrawny arse down there and bought a ticket”. So, consider this your warning. I cant say anything more than I have, but, BUY, steal, rob your best friend’s, do anything, but get that golden ticket today. Tell your friends too, because trust me, you’ll be kicking yourself on Sunday morning if you dont!